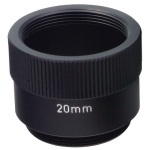 This 20 mm spacer ring will dramatically increase system magnification while decreasing the depth of field. Because the associated lens will be operating well outside its original design parameters, image quality will suffer. In general, it would be better to install a higher-magnification lens than to add this spacer.